Paul Nicholson answered some of the questions sent in by his twitter followers at the charity night in Horsham last week. Visit www.dartshop.tv to book tickets to see ‘The Asset’ in action at one of our exclusive non-televised professional events. Michael van Gerwen answered some of the questions sent in by his twitter followers at the charity night in Horsham last week. 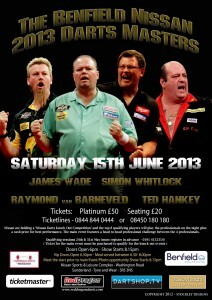 Visit www.dartshop.tv to book tickets to see Michael in action at one of our exclusive non-televised professional events. 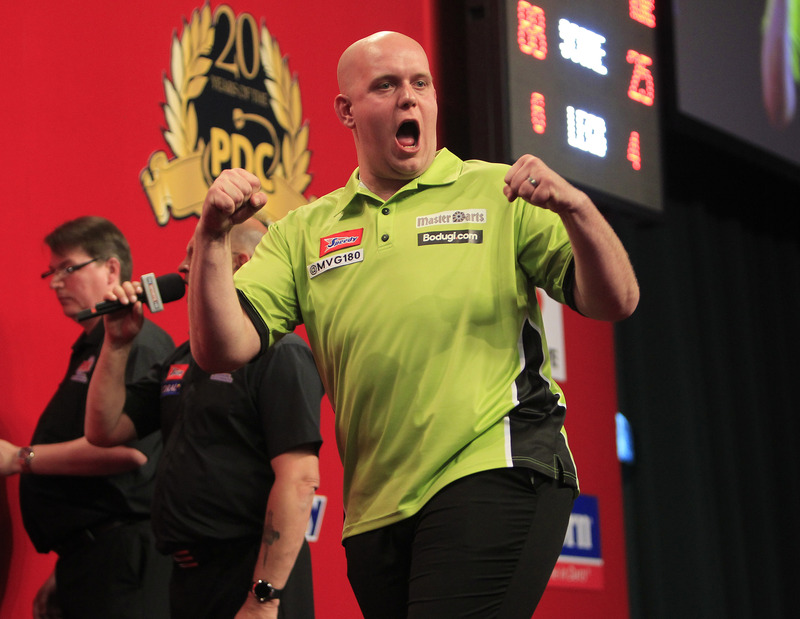 Michael van Gerwen won his twelfth title of an amazing year so far when he claimed victory in the sixth Players Championship event of 2013 at Crawley’s K2 on Sunday. The world number two defeated Andy Hamilton 6-1 in the final, after missing out at the semi-final stage on Saturday, when he was defeated by Wez Newton. But the Dutch sensation stormed back in Sunday’s event, which he kicked off with wins against Kevin Dowling and Richie Burnett, before claiming a 6-0 whitewash over Ronny Huybrechts to reach the quarter-finals. There, he saw off Andy Smith before hitting back from 5-2 down to defeat Brendan Dolan 6-5 in the last four, where he also missed double twelve for a nine-darter. And his final victory over Hamilton saw him pass the £100,000 mark in prize money from from Pro Tour events alone this year. Darts fans packed out Roffey Sports and Social Club, Horsham on Friday night as over £5,000 was raised for charity. Premier League darts stars James Wade, Simon Whitlock, Michael van Gerwen and Robert Thornton were joined by fellow professionals Mark Webster, Paul Nicholson, Vincent van der Voort and Co Stompe for a night of top quality arrows, hosted by legendary commentator John Gwynne. The total amount raised from ticket sales, raffle, auction and donations was £5,250, with all proceeds being split between Bipolar UK and Bradbury Enhanced Care Service. Bipolar UK is the national charity dedicated to supporting individuals with the much misunderstood and devastating condition of Bipolar, while Bradbury Enhanced Care Service provides crucial support for young adults with complex health needs, physical disabilities and life limiting conditions. All players and staff gave their time freely for what was a wonderful night for two worthy causes. World number four Wade, who gave a speech about his experience with Bipolar disorder, said: “I want to thank all the players for giving up there time to support the two causes. 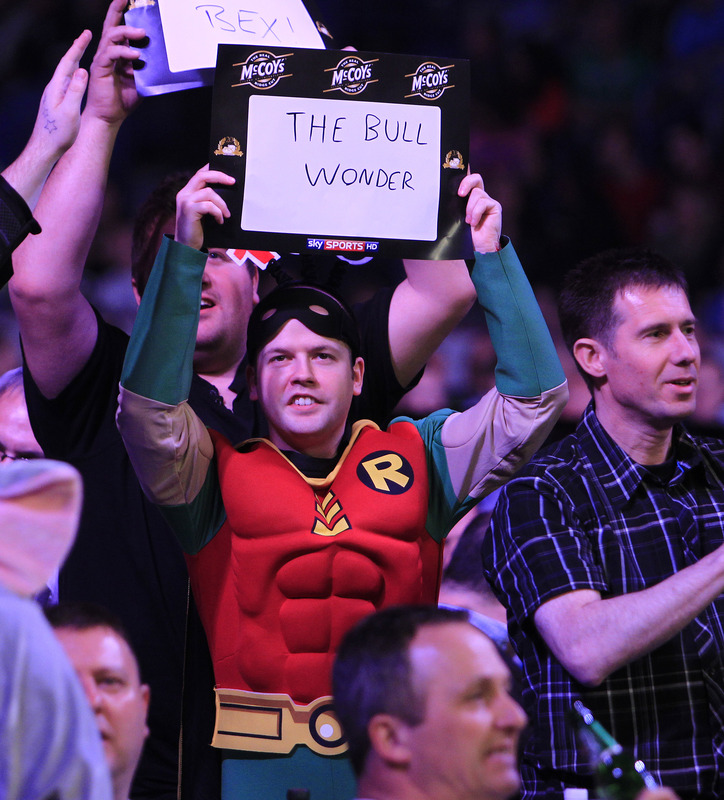 The PDC have announced a new three-year contract with ITV, which will see them broadcast four events each year. The European Championships and Players Championship finals will be broadcast on ITV in 2013, 2014 and 2015, as will a brand new event – The Masters – where the world’s top 16 players will do battle in November in Edinburgh. Further to this, the free-to-view broadcaster will also show the live UK Open finals from 2014. 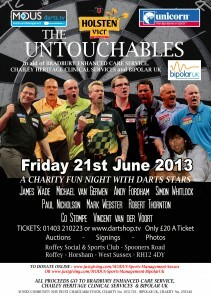 Stephen Fry has backed the upcoming Untouchables charity darts night by tweeting about the event. Fry, who is an avid darts fan, mentioned the event on his official twitter page in a huge boost for potential fundraising for the two charities it is being held in aid of – Bipolar UK and Bradbury Enhanced Care Service. The fundraiser, which will take place on the evening of Friday 21 June, will see some of the world’s top professional darts players perform at Roffey Sports and Social Club, Horsham. Premier League stars James Wade, Simon Whitlock, Michael van Gerwen and Robert Thornton are amongst a fantastic line-up for the event. They will be joined by former Players Champion Paul Nicholson, former World Champions Mark Webster and Andy Fordham and the Dutch duo of Vincent van der Voort and Co Stompe. All funds raised from the event will be split directly between the two charities. Fry, the famous actor, comedian and presenter, has been diagnosed with Bipolar disorder and is a patron of Bipolar UK. His tweet is a huge boost for both charities as it raises awareness of the event to his millions of twitter followers. Tickets are priced at £20 and are available here or by calling MODUS on 08450 180 180. Attendees are reminded that all proceeds will be split between the two causes, with further fund-raising activities taking place on the evening. Items have already been donated for auction by World Snooker, Matchroom Sport and Unicorn Darts. Donations can also be made via this page for Bipolar UK or text the amount you would like to donate & Dart52 to 70070 OR click here for Bradbury Enhanced care or text the amount you would like to donate & Dart54 to 70070. Some of the world’s top darts players will take part in a charity fundraising night at Roffey Sports and Social Club, Horsham for the second consecutive year next week. 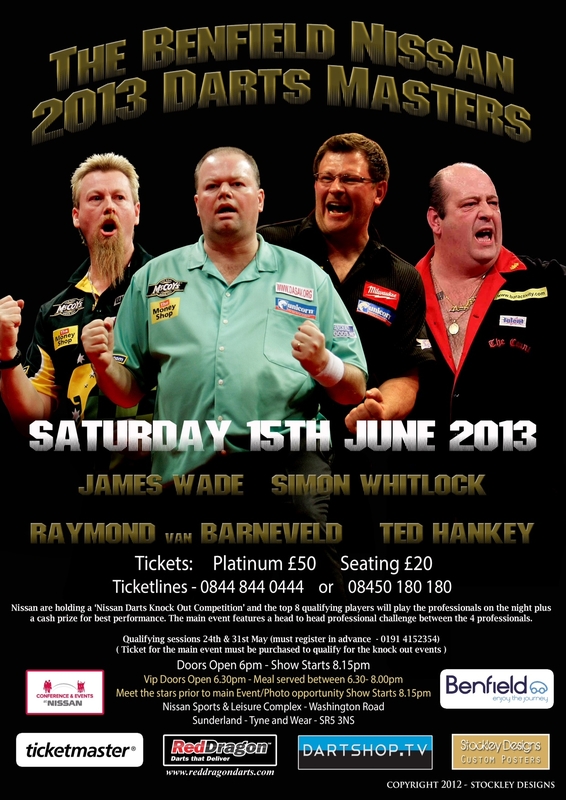 Premier League stars James Wade, Simon Whitlock, Michael van Gerwen and Robert Thornton are amongst a fantastic line-up for the event, which will take place on Friday 21 June in aid of two causes. All proceeds from the night will be split between Bipolar UK and Bradbury Enhanced Care Service. Joining the quartet of Premier League stars, will be former Players Champion Paul Nicholson, former World Champions Mark Webster and Andy Fordham and the Dutch duo of Vincent van der Voort and Co Stompe. Wade, winner of seven major titles, who has the condition of Bipolar, is delighted to support both charities. He said: “I’m looking forward to the night. Both causes are so worthy and all of us players are pleased to be in a position to support them. “My problems have been well-documented but help is out there and if it wasn’t for charities like these it wouldn’t be so accessible and people with the same condition as myself would be suffering horrendously. 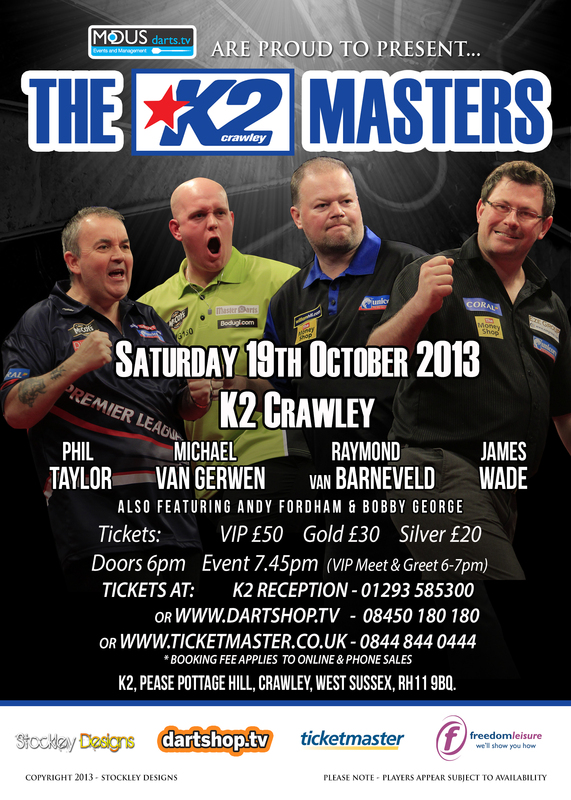 Fans will be given the chance to take on the arrows aces before the professionals compete in an exclusive tournament. Photograph and autograph opportunities will be available on the night as some of stars of top professional sport and fans come together in aid of two fantastic charities. Darts Fan Harry Potter is Spellbound by Wade! Actor Daniel Radcliffe is a fan of seven-time PDC major winner James Wade, it was revealed this week. The 23-year-old, who rose to super-stardom playing the title role in the Harry Potter film series, may have been a top ‘Quidditch’ player on screen but Radcliffe is actually a huge fan of darts. And, though you might expect his favourite player to be ‘The Wizard’ Simon Whitlock, the esteemed film star is a secretly a fan of ‘The Machine’. Radcliffe’s passion for darts and support for Wade was revealed by Irish pop group The Duckworth Lewis Method in a BBC Radio 2 interview. You can listen to The Duckworth Lewis Method in interview here. Raymond van Barneveld was denied a place in the UK Open final after losing a dramatic last-leg decider against Andy Hamilton, who was defeated in the final as Phil Taylor won the Bolton tournament for the fifth time. James Wade and Michael van Gerwen had their title hopes ended in the quarter-finals on Sunday afternoon, losing out to Taylor and Hamilton respectively. Michael van Gerwen, James Wade and Raymond van Barneveld all moved into the last eight of the UK Open with wins on Saturday evening. van Gerwen will meet Phil Taylor after defeating Terry Jenkins in Bolton. The Dutchman saw off Jenkins 9-3 before being drawn against world number one Taylor in a repeat of the World Championship and Premier League finals. I am happy to play anyone,” said van Gerwen, who won has recently won the Premier League, Dubai Darts Masters and a European Tour Event. Wade cruised past John Henderson to set up a sixth round clash with Andy Hamilton. ‘The Machine’ triumphed 9-4 against the Scotsman as he bids to win the tournament for a third time. “I wasn’t at my best and it was lucky for me that John wasn’t either,” said Wade, the 2008 and 2011 winner. “There is massive strength in depth in the PDC at the moment so it is a huge achievement for me to be in the quarter-finals. 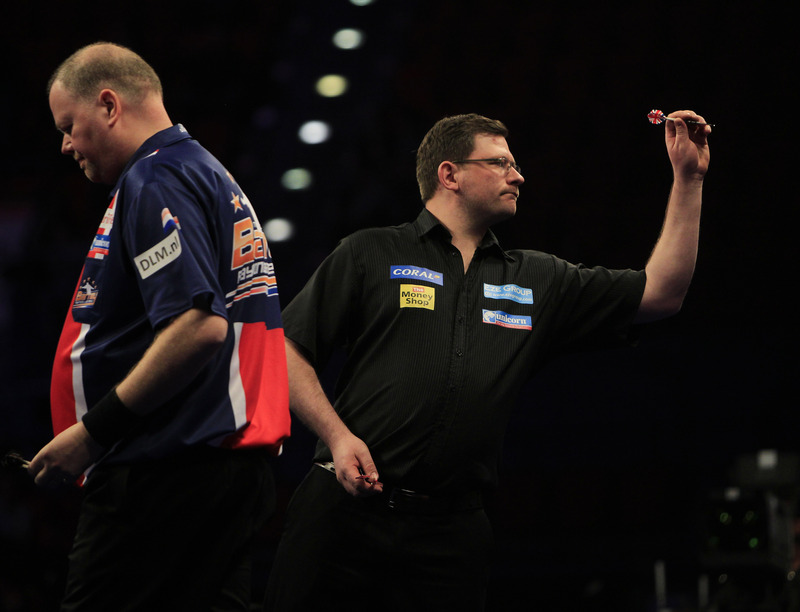 van Barneveld saw off defending champion Robert Thornton in a thrilling last 16 battle. The Dutchman won 9-7, averaging over 100 in the process. “I’m very happy,” said van Barneveld. “The way Robert has being playing, I knew I would have to hit that kind of average to beat him and it was a massive relief when that last dart went in. The draw for the semi-finals will take place following the quarters on Sunday afternoon.